Polarisation has been a problem for Turkey for a long time: right versus left, Kurd versus Turk, Alevi versus Sunni, secular versus non-secular. But now, the division between supporters of the AKP – Erdoğan’s party – and their rivals has become one of the country’s biggest fissures. As the country grapples with the threat of Islamic State just across the Syrian border, Turkey’s low-intensity civil war has been ramped up again with the Kurdish PKK mounting attacks on security personnel and the state responding with violence of its own. Recent fighting has claimed the lives of more than 60 military personnel, 400 PKK fighters and a considerable number of civilians, who are treated as casualties of war. The so-called peace process has entirely stalled, although it’s debatable whether it was really going anywhere in the first place. Restrictions on movement in eight provinces have been introduced, raising fears that the state will enact “emergency laws” to allow a heavy crackdown. A district of Diyarbakir called Silvan was attacked by the Turkish military in mid-August; it was seriously damaged, and many residents had to flee to survive. Kurdish people are forced to live in an environment of insecurity as if they are being punished for not voting for the AKP, which also meant Erdogan’s way to the presidential system. On the Kurdish side, the leader of the pro-Kurdish HDP party, Selahattin Demirtaş, has called on the PKK to end its violence, but everyday funerals are being held for Turkish soldiers killed during clashes with the PKK. These funerals have become a way for Turkish voters to show their rage not only at the PKK for its attacks, but also at the AKP and its MPs for putting their countrymen in harm’s way. Alkan was a lieutenant colonel in the Turkish army, and spent a good part of his life protecting Turkey’s territorial integrity against the PKK. His anger was directed at the government, and at its representatives at the funeral who were trying to make election propaganda of his brother’s death. The cynicism around the civil war has reached the point where no side can even mourn its dead without being exploited for political ends. Alkan soon found out the hard way what happens to those who speak out. 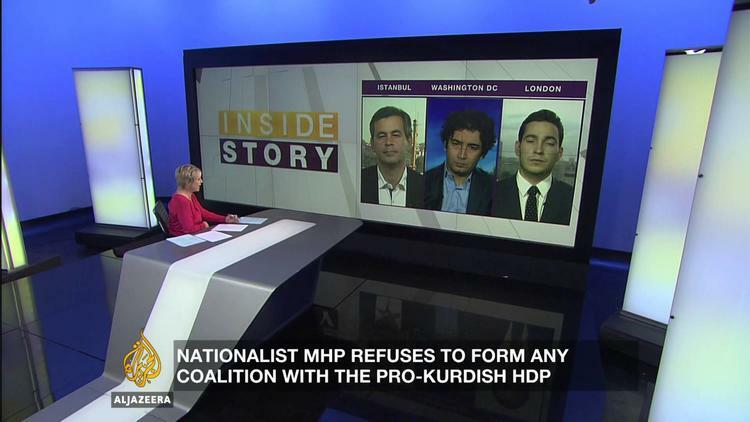 Immediately after his tirade was reported, pro-AKP Twitter users began smearing him as a member of one or all of the groups designated as enemies of the Turkish state: the Alevists, the pro-Kurdish HDP, and the Hizmet Movement – a huge transnational Islamic movement some regard as a parallel state. This sorry state of affairs is not just an unfortunate collision of circumstances. It has been nourished by the current AKP government, which was put in a corner by the HDP’s biggest-ever electoral haul and entry into parliament. It is now trying desperately to gather the nationalist and conservative votes it needs to win its longed-for parliamentary majority. The AKP’s calculation appears to be that more chaos will mean more votes, with people turning to the devil they know in hope of stability. On the face of it, the latest PKK-Turkish army clashes have driven many groups on both sides back into their traditional corners. But things are changing as well – and it is clear that many Turkish voters are anything but won over by this new strategy. And the public’s reaction to the deliberately contrived chaos has so far defied the AKP’s expectations. People all over Turkey are now questioning what intentions lie behind the resurgent violence. Kurds have always been suspicious, but this is new to the Turkish population at large. While polarisation and unrest are in themselves hardly new to Turkey, the current division of Turkish political and social life is more intense than it has been for decades. As HDP MP Gülten Kışanak recently mentioned, this is a very different era. In the 1990s political killings were executed in secret, and violence was covert; nowadays, they are carried out without any shame or pretence. In this deeply polarised climate, the obvious reaction is to take sides. That’s exactly what the AKP wants Turks to do, and it’s highly dangerous. It not only harshens the tone of political discourse; it exacerbates all the deeper, long-existing divisions that undermine Turkish civil society. The run-up to the snap election will be a very dangerous time not only for the HDP, but for all opposition groups, who must now mount election campaigns in a deliberately cultivated environment of violence and fear. To be sure, this began a long time ago – the HDP’s party buildings were constantly coming under attack even before the June elections – but it is getting substantially worse. As things stand, Turkey offers no promise of a better future to any of its warring groups. And with the campaign for the newly declared elections already sinking into a factional brawl, the signs are ominous indeed.